Conan | What's On Tonight? On TBS, Conan airs Monday through Thursday beginning at 11:00 p.m. eastern time, and is immediately followed by The Pete Holmes Show, which is produced by O’Brien’s production company Conaco. The show had been followed by comedian George Lopez’s talk show, Lopez Tonight, until its final episode on August 11, 2011; it was then followed by reruns of The Office until The Pete Holmes Show premiered on October 28, 2013. 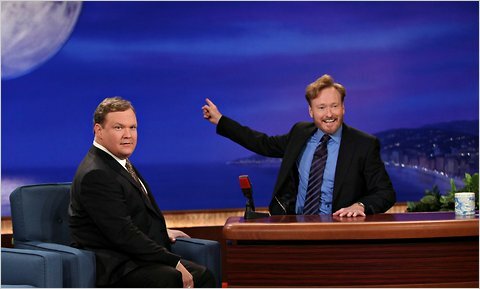 Comedian and actor Andy Richter continues his role as sidekick to O’Brien, and as the show’s announcer. Conan’s long-time house band continues with the host under the new moniker Jimmy Vivino and the Basic Cable Band, with Max Weinberg being replaced as bandleader by guitarist Jimmy Vivino and as drummer by regular substitute James Wormworth, both of whom regularly substituted for Weinberg during his brief departures. Conan Christopher O’Brien (born April 18, 1963) is an American television host, comedian, writer, producer, musician, and voice actor. He is best known for hosting several late-night talk shows, the most recent of which, Conan, premiered on American cable television station TBS in 2010. O’Brien was born in Brookline, Massachusetts, and was raised in an Irish Catholic family. He served as president of the Harvard Lampoon while attending Harvard University, and was a writer for the sketch comedy series Not Necessarily the News. Paul Andrew “Andy” Richter (born October 28, 1966) is an American actor, writer, comedian, and late night talk show announcer. 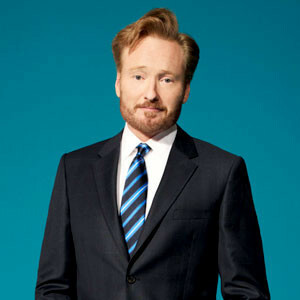 He is best known for his role as the sidekick of Conan O’Brien on each of the host’s programs: Late Night and The Tonight Show on NBC, and Conan on TBS. 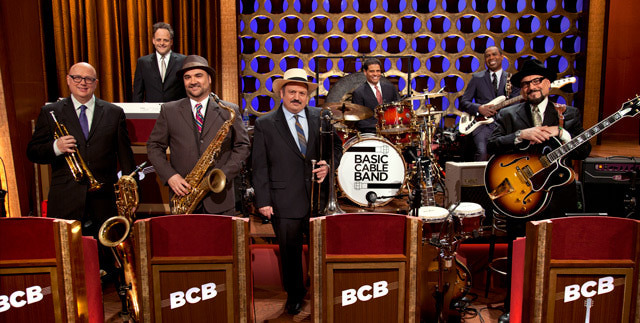 He is also known for his voice work in the Madagascar films and for starring in the sitcoms Quintuplets, Andy Richter Controls the Universe, and Andy Barker, P.I..
Jimmy Vivino and the Basic Cable Band is the house band for Conan O’Brien’s late-night talk show Conan which debuted on November 8, 2010. Guitarist and arranger Jimmy Vivino is the group’s leader. The group was originally formed and led by drummer Max Weinberg in 1993, and played under the name The Max Weinberg 7 when it was the house band for Late Night with Conan O’Brien in New York through 2009. The band then played under Max Weinberg and The Tonight Show Band during their brief 2009–2010 stint on The Tonight Show with Conan O’Brien in Los Angeles. They were then briefly known as the The Legally Prohibited Band during their participation with O’Brien in the 2010 The Legally Prohibited from Being Funny on Television Tour.